More limited edition collector fragrance bottles, with the usual disclaimers: in most of these cases, the juice is unchanged, just the bottle is “special” (or not, as the case may be). 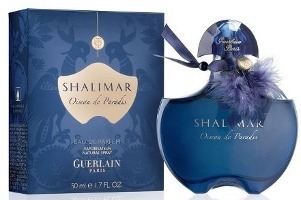 From Guerlain, Shalimar Oiseau de Paradis, which appears to be a collector bottle of the Eau de Parfum, but which might turn out to be a new flanker? We'll see. Meantime, it is at Dillards in 50 ml for $100. 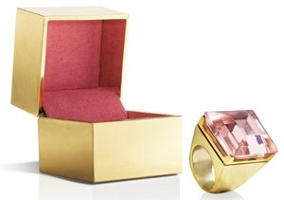 At Neiman Marcus, a Very Hollywood Eau de Parfum ring from Michael Kors: "A solid perfume is discreetly concealed under a stunning gem—ideal for red carpet-worthy touchups." $40. At Sephora, the Yves Saint Laurent L'Homme travel set (above left), with two 10 ml sprays for $35. At Elizabeth Arden, Rocawear 9IX in the "Gold Limited Edition" (above right), 100 ml for $65. 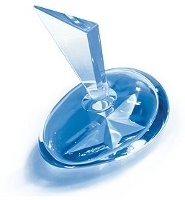 Thierry Mugler's Angel, in the Angel Winter Star edition (by the name, I assume I'm rather late with the news): "Experience a sensual indulgence with a dramatic vintage limited edition. The distinctive bottle echoes the shape of a celestial droplet from the winter sky, a precious star carved into the glass. The unique bottle holds the intensely delicious scent of ANGEL perfume extract - a deep, concentrated version of the secret of absolute seduction..." $340 at Saks. At Nordstrom, Badgley Mischka's Couture fragrance in Parfum Elixir: "A modern way to experience fragrance, this luxurious parfum gel glides on to pulse points, leaving skin silky soft and sensually scented." 15 ml is $48. egg-zackkly! was thinking the very same thing! LOL…it is not something you’d expect to see worn on a red carpet. Might be fun to keep in your purse though! But only if it smelled good. Which this doesn’t. I have coveted that black one from day one! But I do like this blue one also and it’s pretty affordable for a collectable to boot! It’s a much better price, but if it does turn out to be nothing but a collector bottle, seems odd that they did 3 of them in 1 year. This one sure sounds like a flanker though – dontcha think? If she has anything to say, I wonder why she doesn’t say it publicly when the scent is released? Guerlain’s PR machine is the oddest of them all…they honestly seem like they don’t really want their fragrances to sell at all. Like you, I’ve been wondering about the mysterious workings of Guerlains PR machine for quite some time… Anyway, I got a reply from her stating that both the Habit Rouge Beau Cavalier and Shalimar Oiseau de Paradis will be limited edition bottles containing the normal Eau de Parfum versions of the scents. They are very strange over there…but huge thanks for passing on the news! YSL used to give those L’Homme travel sets away as a gift with purchase. My son has a few that he uses from time to time. 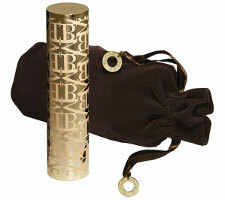 The Badgley Mischka bottle is cute; I’d love to have that in my make up bag. I just wish it were the original Badgley fragrance! I dunno why, but I kind of like that Angel Winter Star thing. I guess it’s ok if I just like it to look at… it’s not like I’m buying it or anything. I’ve still never smelled Angel (not actively, anyway). I think it is quite pretty, myself. I think that’s a great bottle. i found the “michael kors very hollywood ring” very unique and original..though the ring’s design isn’t very attractive, but the concept is very cool! I like the idea of it too…and love that so many companies are doing solids lately. This one is just too big and too pink for me. im so gonna make it as a pendant!